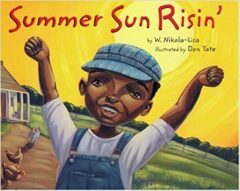 A fun book to share with your younger students as the school year ends is Summer Sun Risin’. This book is great for a read aloud with its bouncy rhythm. The book follows the main character, a young African American boy, as he tags along with his family doing their daily chores on their farm. It harks back to the 1950’s on a Texas farm. The illustrations are colorful and cheerful, and the sun is a prominent element in the pictures. The illustrator of the book is celebrated artist and author Don Tate who lives here in Austin. I had the privilege of meeting him just as this book was published.